In a time when the world seems depressed economically and emotionally, it is easy to find people who are merely surviving, and sometimes it seems nearly impossible to tap into those who are truly thriving in their lives.This invaluable resource is a collection of history. Each contributor shares their testimony of trials, challenges and their rise to success. Their stories will leave an imprint on your heart forever. 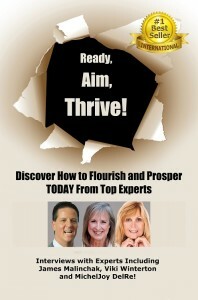 Ready, Aim, Thrive! 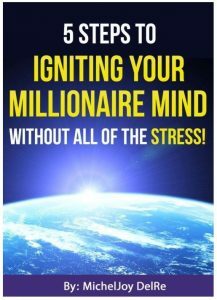 is a priceless work that will encourage and inspire you to be triumphant over your own obstacles. This is your time to stop striving and start thriving. Experts include: Viki Winterton, James Malinchak, Andrea Lard, Beth McBlain, Clint Arthur, Gregory Cook, Jamie Dickenson, Melanie Fatuesi, Norka Parodi, Dr. Tiana Von Johnson, Galit Goldfarb, Jill Mooradian, Lynette Louise, Mary Beth Daniels, Susana Tuya Sarmiento, Wren Owens, Bonnie Gordon Patterino, Cali Gilbert, Diana Kendros Makeig, Emily Petroff, Hal Price, Melanie Robinson, Steffi Black, MichelJoy DelRe, Susanne Whited, Susie Briscoe and Yossi Daniel. Your journal is your sacred place. Here you can capture and foster your most creative thoughts and inspired ideas. 188 of the finest minds and biggest hearts in the world of empowerment come together in this book to encourage you daily to realize your greatest vision. 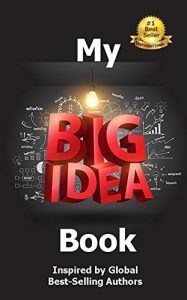 My Big Idea Book — the most recent in the series of #1 International Best-Selling books from Expert Insights Publishing — is an incredible wellspring for readers looking for daily support and encouragement to achieve business and personal success in today’s unpredictable world. There is so much power in the written word. Capture yours here for your personal enrichment, and share this journal with others to encourage their greatness. A portion of the proceeds from this book have been donated to SupportingOurServicemen.com. Your journey of transforming stress and resignation into TURNED ON ALIVENESS is my own journey that started over 30 years ago. After a banking career, having a baby, and completing college, I was still left with a deep sadness. One day, when I wasn’t sure if there was anything to live for, I heard a speaker say “You were made for greatness”. I didn’t fully believe him then but, it was enough to motivate me to begin a search for greater possibilities. I am committed to inspiring you to play your BEST game in life and realize your dreams by Igniting Your Millionaire Mind. Your journey begins with one simple step…OPEN your FREE GUIDE. Let’s create Miracles together!